Upon the arrival of Boppard main station please take the 'Hunsrückbahn' (Hunsrück Railway) and get off at Emmelshausen. The journey takes about 40 minutes. Enjoy the view! Emmelshausen is located at the 'Hunsrückhöhenstraße' B327 or the motorway A61 (exit Emmelshausen). There are only a few steps from central railway station Koblenz to the central bus station Koblenz (ZOB). Take the bus 621 to 'Emmelshausen-Schulzentrum' and get off at 'Emmelshausen Bahnhof'. The journey takes about 50 minutes. From the airport you can take different buses to Emmelshausen (depends on the time of day). The shortest connection (approx. 50 minutes) is the bus 610 to main station (ZOB) Koblenz. Get off at 'Industriegebiet Tankstelle, Dörth'. From Dörth take the bus 627 to Emmelshausen train station. Wonderful hiking trails, imposing castles, romantic river landscapes, delicious wines - the Rhine-Moselle-Triangle is one of Germany's nicest locations for guests from all over the world. If people think about Germany's rivers like Moselle or Rhine, they think about small towns named Cochem, Rüdesheim, Traben-Trarbach or Boppard. Few people think about Emmelshausen. However this is a big mistake. Emmelshausen is really a hidden gem. Right at the front of the Hunsrück, it is a central starting point to explore the surrounding area. 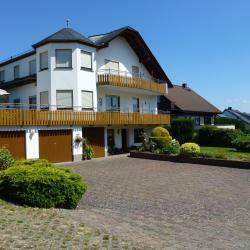 Here you will find small and affordable hotels with a family atmosphere and the fine cuisine of the Hunsrück. No matter whether you are on the move on foot, by bicycle, by car or by rail – Emmelshausen is starting point for amazing trips to Rhine and Moselle. Visit the famous Loreley (Lorelei) or one of the historic castles. You will be impressed by the picturesque valleys. Wine plays an important role. Come and take part in a wine tasting and learn about the vintner's craft. The German Rhine and Moselle wines are known all over the world. Emmelshausen is easy to reach by public transport or car. The Tourist Information centre in the 'Zentrum am Park' will be happy to help you. Enjoy your trip! Ehrbach gorge (Ehrbach-Klamm), the Baybach valley (Baybachtal), the Rheinhöhenweg or the Gründelbachtal are just a few of the fantastic hiking trails around Emmelshausen. Nature here is breathtaking: darks forests, steep rocks, softly murmuring brooks and last but not least the Rhine or the Moselle. A ride with the Hunsrück railway is highly recommended. The section of the Hunsrück railway from Boppard to Emmelshausen is the steepest adhesion railway in western Germany. The route leads over two viaducts with arched arcades: the Rauschenloch viaduct and the Hubertus viaduct. Viaducts are exceptionally bridges that are architecturally very interesting. In the Rhine-Moselle triangle around Emmelshausen, you will find the greatest concentration of castles in Europe. The Castle of Eltz and Stolzenfels, the ancient Ehrenburg or the Maus castle are just a few of the fantastic buildings from a time long past. The region advertises with the slogan "A castle everyday" and it's probably not exaggerating to say that. Many shipping companies offer boat tours – a nice way to relax after strenuous hiking tours. Let yourself be charmed by steep vineyards at the Moselle or the little towns and the 21 castles and ruins between Koblenz and Bingen in the Middle Rhine Valley (Unesco World Heritage).